Let me tell you how it all began. I remember back in 2006 seeing a yurt for the first time. The family were at Glastonbury Festival, my brother, his three daughters and me, all squeezed into a couple of tents, or should I say ‘nylon nightmares’ ! Then we saw it...a 16ft yurt, all the children’s wet clothes were hanging up to dry around the wood burning stove which also had the kettle on for tea, and everyone relaxing on cushions and bedding, we were captivated, having never seen anything like it before...we’d just got to have one. Looking into buying one and seeing what was on offer, I decided to build my own instead. My training as a cabinet maker and antique furniture restorer and the experience I gained over many years made this an easy task and my first yurt became the start of a passion and a business. Now here I am 12 years later having built over 50 Yurts of all sizes from a little 14ft to a huge 75ft stretched yurt and today I’m still busy designing and building the next generation of alternative marquees and structures for weddings, events and family get togethers. 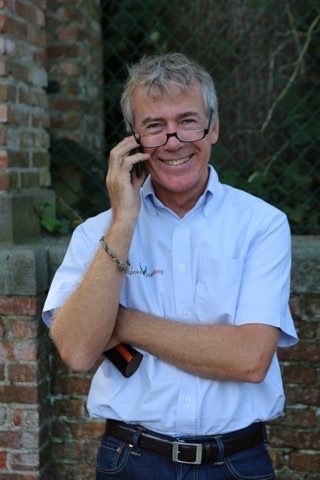 The knowledge and experience gained over the last decade has been invaluable in helping people with their yurt questions and problems and I’ve thought for many years that there should be a ‘reference library’ for yurts, their owners, their questions...or just a place to hang out with ‘yurt minded’ people. So here it is...the beginnings of a self help yurt community. 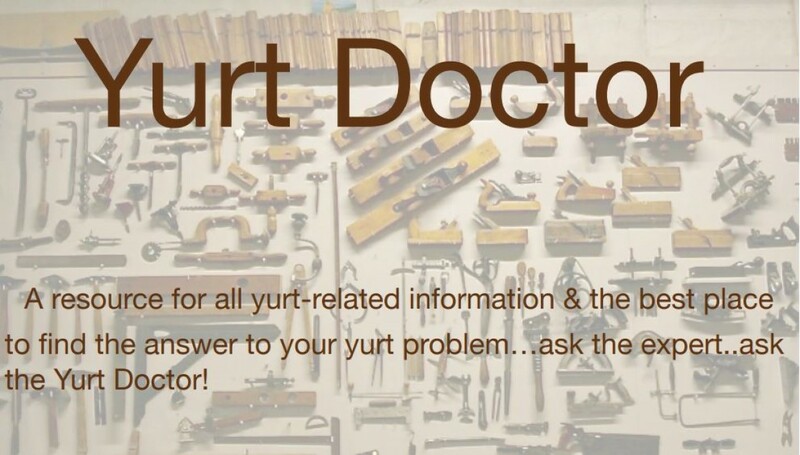 When a Google search can’t answer the question you have about your yurt (and lets face it most of us do exactly that on all sorts of subjects) visit Yurt Doctor instead and ask the question directly. We’re all here because we’re passionate about yurts and eager to share our knowledge and love of everything yurt related. I’m making a yurt from ash wood which we’re hoping to use for family holidays next year and I’d like to know what wood you’d recommend using for the door. We don’t want anything too heavy as it’s going to travel on the roof rack of our estate car but it needs to be sturdy and long lasting. Any suggestions please? There are some ideal choices of wood to make your yurt door from. In my workshop, I always use air dried oak for yurt doors keeping the boards to no more than 6.5” and allowing plenty of room in the tongue and groove for expansion. If you want to use wider boards I would recommend only using quarter sawn (boards cut at 90 degrees to the surface of the tree) to minimise the possibility of the boards ‘cupping’ and don't forget to still allow space in the tongue and groove. Oak also stands up very well against rot and wood beetle infestation. Another very good choice would be Chestnut. Again air dried. Chestnut has very similar qualities to oak but is not subject to as much movement, it is however subject to shake (splits) so be sure to check the boards over carefully before buying. It is also excellent against rot and wood beetle infestation. Chestnut is the preferred wood for fence posts as it lasts for a long time in the ground. If you are wanting a soft wood I would say Douglas Fir would be a good choice, it’s a very stable wood and one of the hardest of our native soft woods. The beautiful figuring in the wood can make for a very attractive yurt door but it can be susceptible to wood beetle infestation so keep a careful watch for any tell tale signs and treat immediately. If you’re tempted to use ash (especially as you will probably have some left over after completing the frame) don’t forget that it will turn black if it is exposed to the elements so it’s really important to keep the door protected with a good quality oil or varnish at all times. The frame of course is protected from the elements being on the inside of the canvas, whereas the door isn’t. Any oils and varnishes that are applied will require maintenance to be sure they keep out any water. Ash can also be susceptible to wood beetle infestation. Good luck with your door and don’t forget to send a photo when its finished and we’ll share it on here. Our yurt problem is our door. The yurt goes up every summer and as soon as it rains the door swells and won’t close properly. We’ve shaved bits off the door but we’re worried to take too much off in case we’re left with a big gap. I’m sorry to hear about your door problems. Wet weather can cause issues for doors that weren’t necessarily designed to be exterior doors and if you think about the front door on your house, it’s likely to be much more weatherproof than your yurt door. Make sure to site your yurt with the door facing away from the prevailing weather to reduce this issue but the best solution to your problem is to protect your door with a porch. On a practical level, it’ll keep the weather off and stop it swelling and aesthetically, a nicely shaped porch can add to the look of your yurt. It can be anything from a simple canvas porch that is easy and quick to fit, to something you design and build yourself. Good luck. I have a three year old yurt up permanently in our garden. It’s used mainly for the children and occasionally for visitors to stay in when we need extra space but I’ve noticed recently that the roof is beginning to leak in a couple of places. I don’t want to take the yurt down as its such a lot of work, is there anything I can do to stop the leaks? If your yurt cover is made of canvas, it’s very unlikely to have failed within three years unless there is obvious damage to the canvas. The most likely cause is that parts of the stitching may have failed. If the leak can be traced to the seams then it’s possible to just treat the seams with a good waterproofing product such as Fabsil without taking the yurt down. The best way of doing that in situ is to buy a small paint roller (the sort you might use to paint edges of walls), soak it in the Fabsil and run that up and down the seams until it’s thoroughly soaked in, you can always use an extension pole to reach higher up. Choose a nice day to make sure the Fabsil has plenty of time to dry thoroughly...and do wear a face mask to protect yourself from any fumes. Good luck and if that doesn’t solve your problem you’re welcome to contact me for further advice.